When students graduate from high school, they have decades of life still ahead of them. Indian River High School is again honoring alumni who have made the IRHS family proud with the 2016 Hall of Fame inductions. Usually, there is just one inductee each year, but this year, two alumni were honored for their service to the community: Vincent E. Mumford (1983) in sports leadership and V. Graig Temple (1993) in emergency services. “We are looking for high standards and representation up there, so to see two this year is incredible,” Principal Bennett Murray said at the May 25 graduating senior awards night. “There’s so many great Indian River High School alumni — not only in our area, but throughout the nation and world — giving back in [many] ways,” Murray said. The Indian River High School Alumni Association re-started the Hall of Fame in 2013, honoring grads who have made significant achievements their professional lives and noteworthy contributions to society. They hope that will help inspire the next generation of students. 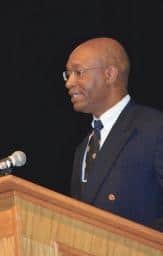 Living in Mount Pleasant, Mich., Mumford is a college professor in physical education and sport at the Central Michigan University College of Health Professions. His expertise has also led him to become a speaker, consultant and author, as well as executive director for Center for Global Sport Leadership, which aims to use sport for a greater good. He has served in many collegiate sports leadership positions, improving the educational programs in New Hampshire, Virginia, Florida, Maryland and Tennessee, even teaching leadership at the Disney Institute in Walt Disney World. He’s published more than 30 papers on gender and racial participation in the classroom and sports field. Mumford created the Frances L. Hall Charitable Foundation to give IRHS scholarships, and he was IR’s 2005 commencement speaker. His service has also won him the American Red Cross Michigan Heroes Award, United States Marine Corps Commander’s Award, Michigan Campus Compact Faculty/Staff Community Service Learning Award, Outstanding Mentor of the Year and many more. “[Indian River is] a place that provided me with the very foundations, provided me with an education that was second to none, and allowed me to compete with anybody in the world,” Mumford said. But that story almost never happened, Mumford said, and the May 25 ceremony was his chance to thank the IR staff who paved his way. Great teachers, including Jack Watkins and Mark Steele, and coach Howard Smack, inspired him to serve in those positions, too, he said. Counselor Babette Sutton gave him the encouragement — and the money — to take the SAT exam in the spring of his senior year, which put him on the previously-unexpected path toward college. He earned his bachelor’s and master’s degrees from in physical education, then a doctorate in educational leadership, all from the University of Delaware. He also thanked his sister and late mother for being role models.